We all leave behind little bits of personal information with every new new step in our digital footprint: What sites we visit, what searches we conduct, what links we follow, and so on. Collecting that information is big business. Every time you visit a website—even this one—a ripple of data is sent through the Internet, often without our knowledge and sometimes without our consent. 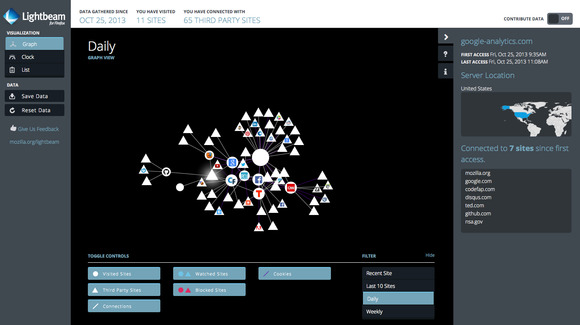 Lightbeam, a visually striking new add-on from Mozilla, helps illuminate the sometimes-invisible connections that weave our digital lives. Not all tracking is bad, but did you realize how much is actually taking place? You can also click on each individual icon—either circle or triangle—and a slide-out will give information on that site. For example, the largest triangle from my brief hands-on was Google Analytics (Google's backend traffic tracking tool), which is apparently sucking up my Web behavior via everyone from TED to Mozilla to the NSA site. Notice how many more triangles there are compared with circles. If you're wondering what happens to the data collected by Lightbeam, the answer is nothing—at least by default. 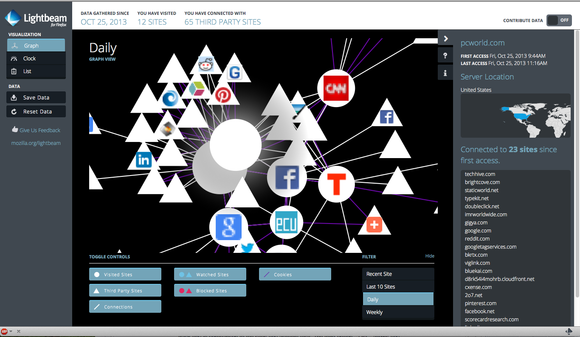 However, if you choose, you can contribute your data to Lightbeam so it can create a "big-picture view of how tracking works on the Internet, and how third-party sites are connected to multiple other sites." Users can join in the crowdsourcing project by toggling the "contribute data" option in the top right of the screen from the default "off." Users also have the option to download a Lightbeam-specific JSON file locally. Lightbeam isn't something that you would use often—most people will probably use it only once or twice, if we're being honest. 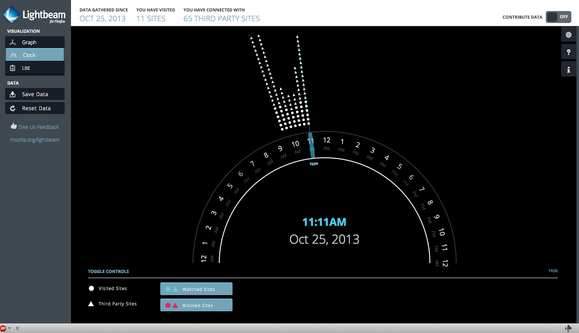 But it is a helpful new tool in the effort to make the Web a more transparent place.